Worship is the most important thing God calls us to do as individuals and as a church. Commonly, worship is considered to be the singing and praise part of a church service. While that is part of it, worship is truly so much more than that. God is not interested in mindless observances; He is interested in a heart that cries out to glorify Him. True worship is a life that honours Him. All of creation worships God -- even the hosts of Heaven worship Him! we are to be generous and share with others (Heb 13:16). One only has to read the Psalms to be reminded of who God really is and why He deserves our praise. The implication is that we give everything and hold nothing back. That's really what worship is all about -- surrendered lives in response to God through and because of His Son, Jesus Christ. At St. Aidan's we seek to reflect all this in the worship that is offered week to week. In our liturgies (forms of worship), we desire to worship God in Spirit (to be touched by God), and in truth (to be in accordance with Scripture and without self-deception). To honour the One "who does all things well", we want our worship to be the best it can be. To reflect our denominational heritage, we offer a wide variety of Anglican liturgical expression: traditional and modern; evangelical, catholic, and charismatic: sacramental, and of the Word. We are also able to express this worship through the creative gift of music. According to Scripture, the atmosphere of heaven is filled with the music used to praise and worship our God. 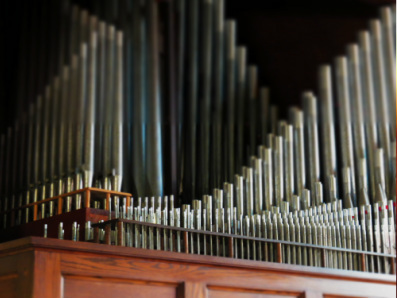 At St. Aidan's music plays an extremely important role in our corporate worship experience. Whether it's vocal, instrumental or both, we use music to convey the Good News of Jesus Christ and to praise Him for what He has done. Through the St. Aidan's Choir and worship teams, soloists and instrumentals, music is the medium we use to testify of God's great love. "True worship is a life that honours Him."